I know it is the wrong time of the year to be baking with strawberries but they are so cheap at the supermarket right now that I couldn't resist. 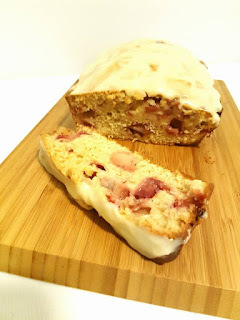 The strawberries I bought were actually nice with a pretty strong flavour, so they are great in this loaf. For those that know that my favourite cake making method in CC is "Chuck it all in and select Pastry P1", things are a bit different here. This cake is a bit like a muffin in that if you overwork the batter it will give you a tough cake. So, here we mix the wet ingredients first, then pop in the dry ingredients and lastly fold the strawberry pieces in by hand. Also, the strawberry pieces are lightly coated in flour - this helps to stop them sinking to the bottom of the loaf and it works. 1. Preheat your oven to 160 degrees. Grease and line a 20 x 12cm loaf tin (if you use larger or smaller adjust the cooking time accordingly. Larger is shorter and smaller is longer). 2. Place the first six ingredients in the bowl with the kneading blade in the order specified. 3. Select Speed 6 Time 10 seconds. 4. Add in baking powder, salt, cinnamon and flour. 5. Select Speed 5 Time 30 seconds. Stop after 15 seconds and scrape down sides. Resume program. 6. Place diced strawberries in a freezer or zip lock bag with the extra flour and shake gently to coat. 7. Fold strawberry pieces gently through the batter. (I find a silicone spatula is best for this). 8. Place batter in the prepared tin and smooth out the top. 9. Bake in the preheated oven for 50-60min. Start checking with a skewer from 50min. 10. Placing a sheet of foil over the top of the loaf at the 40min mark helps to stop it over browning. 11. When a skewer inserted in the centre of the loaf comes out clean it is ready. 12. Leave the loaf to cool in the tin for 5 minutes before turning out onto a wire rack to cool. 1. Mix all ingredients in a jug or bowl until smooth. 2. Drizzle and spread over the loaf. NOTE - this loaf tastes lovely when made but improves in flavour on the second day.